Technology has come a long way over the course of older adults’ lifetimes. They have witnessed everything from men landing on the moon to dramatic medical advances and the rise of an Internet-dependent society. Seniors also bear witness to the ways technology is changing the face of aging. Impact your clients’ quality of life by sharing these five tech solutions that may help to keep older adults healthy, safe and socially connected while making caregiving tasks less stressful for their family members. According to UnitedHealthcare’s 2012 100@100 survey of centenarians, staying socially engaged is just as important to healthy aging as genetics and maintaining a healthy body. While no technology can take the place of in-person human interaction, video chat services like Skype, or Internet-based communication channels such as email and social media, can supplement seniors’ social interactions when visits with friends and family aren’t possible or too infrequent. Seniors can check with their local senior center for Internet how-to classes, or they can have a tech-savvy grandchild get them set up and show them the ropes. Surveys consistently show that 80 to 90 percent of seniors want to stay in their own home as they age. A number of technological solutions can make doing so safer for them. Any senior that lives alone should have a Personal Emergency Response System (PERS). A PERS device allows the wearer to call for help with the simple push of a button. Both seniors and their families can have peace of mind knowing the PERS can facilitate a call for help in any emergency situation. Safety is also a paramount concern for seniors who suffer from Alzheimer’s disease or other dementias, especially those prone to wandering. A number of GPS tracking devices that can monitor a senior’s location and send alerts are great tools to keeps caregivers’ worries at bay and prevent potentially dangerous or deadly situations. Check out these innovative GPS gadgets for Alzheimer’s wanderers. Many nursing homes and assisted living communities have already recognized the recreational and exercise benefits that Nintendo’s Wii sports games offer for elderly adults. Seniors living at home could also benefit by owning a Wii or other video game system controlled by motion. The games offer a fun opportunity for seniors to engage in light physical activity from the comfort of their own living room. For mental exercise, seniors could try games such as Tetris (spatial recognition), Trivial Pursuit (fact recall), or Mahjong (memory and matching). Encourage seniors to practice on their own and then challenge their grandkids. Many seniors find it challenging to keep track of their medications. The reason why is clear: According to a 2009 survey by Medco Health Solutions, more than half of the older adult respondents said they took at least five different prescription drugs regularly, and 25 percent said they took between 10 and 19 pills a day. Pill boxes help, but technological solutions that also provide reminders and “time to refill” alerts could potentially aid adherence to the prescribed medication schedule. Seniors and their caregivers can take advantage of the RxmindMe or Personal Caregiver medication reminder smartphone apps to reduce missed medications and prevent medication errors. Smartphone apps and cloud-based health information tracking systems can help seniors and their family caregivers keep information such as medical history, physician contacts, medication schedules, and health conditions organized and handy. Senior health tracking tools such as Me and My Caregivers also make it much easier for senior care professionals like you to have access to a complete set of information about a senior patient, thus helping you make the most informed treatment decisions. Discover additional benefits of technology for seniors by learning how technology can help seniors stay home longer and reduce senior depression. A sophisticated depth sensor hanging over the front door of an elderly couple’s home in eastern South Dakota tracks their walking speed and even recognizes if either falls. Inside the home, infrared motion sensors monitor the couple as they move from room to room. Even their mattress is fitted with sensors — one on each side of the bed — that monitor their heart rates and sleep patterns at night. In the seven months since their home has been equipped with all those sensors, however, Skubic worries a lot less. She knows that if there’s a fall or some worrisome change in her parents’ behavior, she’ll get an email alert. Peace of mind for family members is just one benefit of the sorts of devices used in Skubic’s parents’ home. More important is this: more and more seniors — even those with health problems ranging from frailty and limited mobility to loneliness and mild cognitive problems — will be able to live independently for longer as a result of sensors and other digital devices. Sensors will also eventually be able to take better care of seniors by enabling homes to take care of their own infrastructure, notifying occupants or even calling a family member or repair person when a faucet drips, a bulb goes dark, or a ceiling-mounted smoke alarm needs a fresh battery. At the same time, digital “personal assistant” devices — like Amazon’s Alexa — will become more integrated into the home and thus more useful. Alexa can already store grocery lists, but someday it or something like it might, for example, monitor milk consumption in the home and order more to be delivered just before the carton is empty. And virtual reality (VR) systems, which are popular mostly with gamers, are now being adapted just for seniors. New systems enable them to take virtual vacations and make nostalgic visits back to places they used to visit without being overwhelmed by buttons. Skubic’s parents are early adopters of sensor technology because she directs the Center for Elder Care and Rehabilitation Technology at the University of Missouri in Columbia and is a national leader in the development of household sensors. Skubic is using data from their home as part of her research. Her computerized systems, now used in a growing number of assisted living facilities across the U.S. — and eventually, she hopes, in more private residences — can do more than track motion. 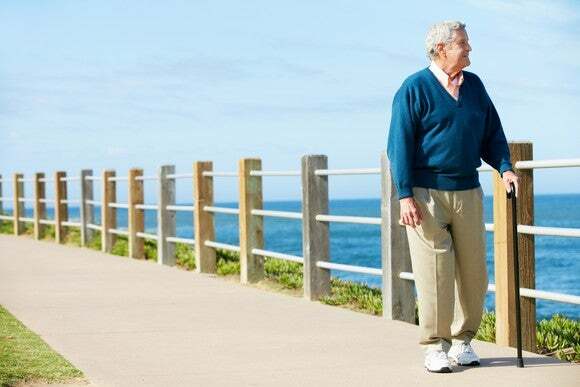 They use a sophisticated algorithm to identify an unsteady gait, nighttime restlessness, or other subtle changes in behavior that might be evidence of a developing health condition. The sensors are unobtrusive — in the case of her parents’ home, they’re mounted in little white boxes in corners of rooms — and their output is continuously analyzed by computers running in her parents home and at the University of Missouri. When they detect anything suspicious, they trigger those emails to Skubic. The sensors showed that Skubic’s mother’s walking speed had slowed slightly following a recent stint in the hospital; her father spends a lot of time out of bed at night. Skubic shared the information with her parents, though in these cases no corrective action was required. Data suggest that the sensors can predict falls up to three weeks before they happen. That gives family members and caregivers time to intervene, perhaps by taking with doctors about an adjustment to medication or adding physical therapy sessions, according to Skubic’s research collaborator Dr. Marilyn Rantz. Sensor technology, Rantz says, can help people safely stay in their homes for two full years longer than they would be able to otherwise. Sensors may make it possible to track movements within and around homes, but, of course, they do nothing to improve the mobility of seniors. Arthritis, balance problems, and other medical conditions can make getting around especially difficult for seniors living in multi-floor homes. But researchers at the Georgia Institute of Technology in Atlanta are working to solve that problem. Under the leadership of Dr. Karen Liu, a professor of interactive computing, they’re developing a staircase that reduces the effort needed to climb it. Liu says she took up the challenge to develop such a system after her 70-year-old mother complained about climbing stairs. As you can see in this video, Liu’s prototype staircase uses springs to capture and store some of the energy a person expends walking down the stairs and returns it to them on the way back via an under-the-foot boost. The team’s device would rest on top of each tread in the staircase, reducing the energy needed to climb each step by an estimated 37 percent. New gadgets will also help combat isolation and loneliness, which are among the biggest problems facing seniors. Isolation and loneliness have been shown to compound health problems — even cause them. In fact, one 2015 study showed that feeling lonely causes as many premature deaths in people over 65 as smoking or being morbidly obese. A tiny Boston-based company called Rendever is betting that virtual reality may offer one solution to the isolation problem. It’s recording 360-degree video of tourist attractions around the world and developing easy-to-use virtual reality systems. Company cofounder Kyle Rand says the videos can remind users of places they visited when they were younger and take them on virtual “group tours” of places they’ve always wanted to go. Users of Randever’s systems — which are already in assisted-living facilities across New England — have ridden Mardi Gras floats, trekked across the Sahara, and returned to quaint New England towns they haven’t visited in years. “Reactions are just like magic,” Rand says of the seniors who have tried the system. The number of videos Randever offers is limited at this point, but Rand hopes eventually to shoot every major cultural site and event in the world, enabling seniors to take virtual trips just about anywhere they want to go. And VR makes it possible to enjoy the jaunts with others using VR gear — whether they’re in the same room or on the other side of the country. All the participants can talk to one another as they explore the virtual world. As more seniors than ever before own smartphones, connect to the internet and use social media , they’re exploring a whole new world. Americans age 50 and older are quickly catching up to younger smartphone users, according to the Pew Research Center . About three-quarters of people age 50 to 64 owned a smartphone last year, up 16 percentage points from 2015. Mobile technology can make daily life easier, simpler and more fun. Check out these 10 free mobile apps with that goal in mind. CarZone: This comprehensive app combines medication and caregiving management. Upload documents and photos; schedule care and medicine through a calendar; track health metrics; and create a journal, a to-do list and contacts. It’s all shareable, and email help is available. Elevate: Studies show mental stimulation may reduce the risk of Alzheimer’s disease. This brain-training app lets you customize a game-based program to strengthen analytical and communication skills. Plus, it’s fun. bSafe: Create your own personal safety social network. The app’s GPS-based features include asking friends, family or co-workers to walk you home; letting people know where you are; and sending out an SOS in an emergency. AARP Now: View daily news briefs, videos and local events (music to sports). Some features, such as discounts, are only for AARP members. The app has been downloaded more than 1.2 million times since launching a year ago. Shopwell: Created by dietitians, this app helps you find healthier food at the supermarket. Use it to scan barcodes, and then the app will score food and suggest better alternatives based on your profile. You can track purchases and get email notifications, health news and tips. MapMyWalk: The app uses GPS to track your workouts (walking, cycling and more) over time. Using an interactive map, create routes or find existing routes worldwide. It’s a great way to explore new areas at home or when traveling. Lyft: This ride-sharing app has programs geared to seniors, providing an alternative to public transportation that may be limited or nonexistent. If you’re not comfortable creating an account by credit card or you don’t have a smartphone, Lyft collaborates with GreatCall so seniors can book rides by calling a person. Uber is another option. Skype: Research shows a strong link between social interaction and well-being as we age. Talk face-to-face with your kids or grandkids anywhere in the world with Skype, which makes Internet calls using your device’s web camera. Personal Capital: This read-only, money management app links all your accounts and bills and provides email notifications, cash-flow reporting and customer service. It has a retirement fee analyzer and retirement calculator. A demo shows how it works. Rain Rain: Sleep is important to maintaining your health. Choose from an impressive library of sounds — including thunderstorms, waves, a cat purring and a dishwasher — to help you snooze better. Simply select the sound, adjust the audio level and set the timer. If you’re saving up for the future, you’re on the right track. But where you put that money matters as much as how much you’re able to put away each month. A new survey by Bankrate.com through Princeton Survey Research Associates International asked more than 1,000 Americans what they consider the best way to invest money they won’t need for 10 or more years. The most popular answer, chosen by 28 percent of respondents, is to use it to buy real estate. Zero-risk cash investments, such as high-yield savings accounts, came in second with 23 percent of respondents, while the stock market took third place, with 17 percent of respondents. However, just because something is popular doesn’t mean it’s wise. Although owning a home and contributing to a high-yield savings account can both help you build wealth, neither are the optimal way to maximize returns in the long run, Bankrate points out. Bankrate cites a study from London Business School and Credit Suisse, which found that after adjusting for inflation, housing offered returns around 1.3 percent per year from 1900 to 2011, while stocks performed more than four times better. So while financial experts, such as self-made millionaire David Bach argue that a home is a crucial investment, real estate is still not a substitute for a retirement fund. High-yield savings accounts offer higher dividends that traditional ones — one percent returns versus 0.01 percent — but they aren’t a replacement, either. “Over the past 10 years, even including the financial crisis, stocks have returned an average of 8.6 percent per year,” Bankrate reports. Sign up for your employer’s 401(k) plan and take full advantage of any company match, which essentially gives you free money. Contribute to a Roth IRA or traditional IRA, which are both individual retirement accounts that offers tax breaks. Use micro-investing apps such as Acorns, which help you begin by investing small amounts of your “spare change.” The app rounds up your purchases to the nearest dollar and automatically put your coins to work. Try other apps that aim to make investing simple and accessible. Consider automated investing services known as robo-advisors that can help you out no matter how much you have in the bank. Research low-cost index funds, which Warren Buffett recommends. Of course, there’s no guarantee how the market will perform in the future. Your returns will vary based on which accounts you choose, when you start investing and how much you contribute. But, if you have cash lying around that you’re not going to touch for 10 years, you may want to try the method that has been offering the most reliable returns. And the earlier you invest, the better. U.S. seniors are employed at the highest rates in 55 years. Almost 19 percent of people 65 or older were working at least part-time in the second quarter of 2017, according to the U.S. jobs report released on Friday. The age group’s employment/population ratio hasn’t been higher in 55 years, before American retirees won better health care and Social Security benefits starting in the late 1960s. Certainly baby boomers are increasingly ignoring the traditional retirement age of 65. Last quarter, 32 percent of Americans 65 to 69 were employed. Even past age 70, a growing number of seniors are declining to, or unable to, retire. 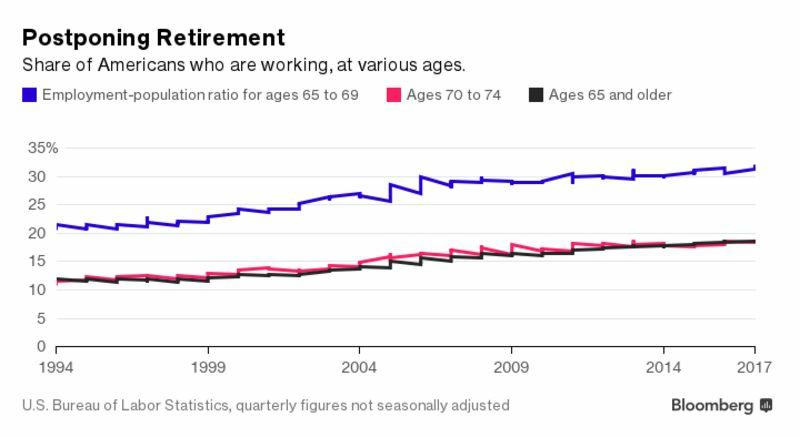 Last quarter, 19 percent of 70- to 74-year-olds were working, up from 11 percent in 1994. 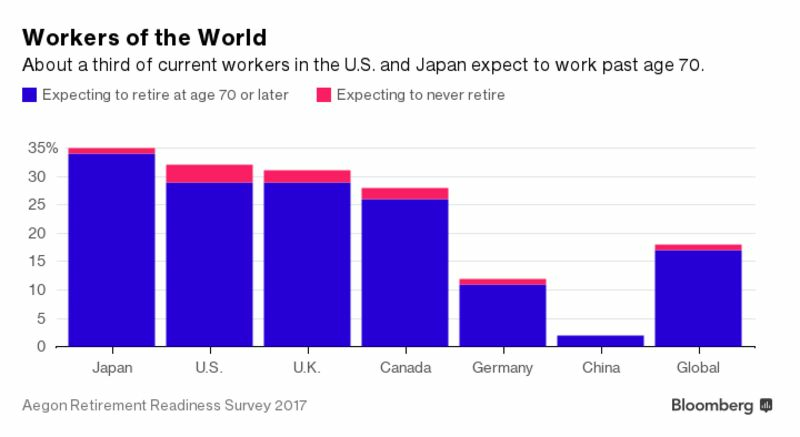 Even after they consider themselves officially “retired,” most Americans are hoping to work a little bit. According to a survey by the Employee Benefit Research Institute, or EBRI, 79 percent of U.S. workers expect to supplement their retirement income by working for pay. “Although age discrimination has been illegal for 50 years, employers continue to see older workers as a liability,” said Ruth Milkman, a sociology professor at the City University of New York. Seniors who want to extend a full-time career may be forced to take temporary jobs, for example, or work as independent contractors. “Frozen out of standard employment, older workers turn to more precarious (and less well-compensated) employment,” Milkman said at a conference last Rather than retire, older workers sometimes switch from traditional jobs to self-employment, according to a studyreleased last month by the National Bureau of Economic Research that analyzed U.S. tax and survey data. In the process, they often switch occupations as well. They pay an economic price for going solo, the study finds, with average annual earnings dropping by $18,160 for older workers. The irony is, those seniors who find it easiest to keep working—healthy, well-educated, and highly skilled people who enjoy their jobs—tend to be the least likely to need the money. Other older Americans, faced with few good job choices, often just decide to retire and and live frugally off Social Security and savings. Most seniors these days are living on limited incomes from sources that may include Social Security, a small pension or maybe some other form of government assistance. With few resources at their disposal, finding services for free or discounted prices is vital. There are likely many of these types of services available through your local Office for the Aging (the name of this government agency may be different in your local area, i.e. Division of Senior Services) or local charities such as Lions Club or Meals-on-Wheels, or on the Internet through sites like ElderCare.gov. However, in my opinion, the most rewarding of these freebies for seniors and their caregivers – things like free hearing aids and free dentures – will be more difficult to come by. From my experiences as a caregiver, I have compiled a list of these types of services and provided a roadmap and examples for how to find them. How many times have you, either as a senior or as a caregiver, wrestled with trying to figure out what type of help was available to you? There is free counseling available through your local Office for the Aging that can provide this type of assistance and point you in the right direction to receiving the help you need.You can get answers regarding health insurance, food stamps and other services through these counselors. Adult day care centers can be run by a government entity, or through a local charity or house of worship. The purpose of these senior centers is to provide a safe place to socialize and have a hot meal in a protected setting. These adult day care centers are ideal for seniors who cannot remain alone, but are not in need of the care that a nursing home provides.If you go through your local Office for the Aging, they will probably be able to direct you to such a day care center, let you know if there is a charge for the facility and what the eligibility requirements are.As for the fees associated with these facilities, if the facility does in fact charge a fee they are normally quite nominal and are just there to help the center cover its own costs for meals and operating costs like utilities.As for the eligibility requirements, that will depend upon the capabilities of the staff at each individual facility. As an example, some adult day care centers will only accept those who are continent because they will not have the supplies to change adult diapers. Other facilities may require a certain amount of mobility for those attending (i.e. they are able to get out of a wheelchair on their own or with minor assistance). It is really ‘hit or miss’ because each facility will have their own requirements.When initially contacting the Office for the Aging or the local charity, give them as much information upfront regarding both the fees (if you are only looking for a free facility) and the physical condition of the applicant. This way they can act as a filter to point you in the right direction. Due to the problems of billing and getting paid by the government, there aren’t many dentists that accept Medicaid, but a few do. This means that a senior with no dental insurance may still be able to get the dental care needed…you just might have to travel to get it.To find a dentist in your state that accepts Medicaid, contact your state Department of Health, but keep in mind that you may have to travel out of your way to get these services. For example, in my home state of New York, the state Department of Health website lists about 40 dentists that accept Medicaid. That’s not a great number for a state with a population of 19,500,000. On Long Island, where I live, there are only two. As incredible as it may seem, it is possible for low-income seniors to receive a free set of dentures. In addition to calling your Office for the Aging to see if they know of a source, here are two additional places to look into:Your State Dental Association: here you will be able to access free or low-cost dental programs. As an example, one of my customers contacted the Ohio Dental Association and was then directed to Dental Options (in Ohio). She discovered her mother was eligible and will soon be getting the help she needs. While these services will vary based on your location, the place to start is with your state dental association.Dental Colleges: while not free, if there is a local dental college in your area you could get a substantial discount on dental care. EPIC is the name of the State Pharmaceutical Assistance Program in New York. New York is one of the 23 states that have such a program (the other 27 canceled their programs after the Federal government instituted Medicare Part D). If you live in Colorado, Connecticut, Delaware, Idaho, Illinois, Indiana, Massachusetts, Maryland, Maine, Missouri, Montana, North Carolina, New Jersey, Nevada, New York, Pennsylvania, Rhode Island, Texas, the U.S. Virgin Islands, Virginia, Vermont, Washington State or Wisconsin, you have access to another means of assistance to obtain your prescription medications.Income requirements vary from state to state, so you will have to check with your state administrators to determine your level of eligibility, but this can be a great way for seniors to save on their prescription drug costs. Despite the advent of Medicare Part D, and certain state run assistance programs such as EPIC (outlined above), there are still many seniors that cannot afford their medications.This is why most manufacturers of prescription drugs provide assistance for those who cannot afford their medications. A comprehensive list of these programs is provide by the Partnership for Prescription Assistance as well as the steps to follow to apply for assistance.Another cost saving strategy is to make the switch to generic drugs. According to the Food and Drug Administration, “Generic drugs are important options that allow greater access to health care for all Americans. They are copies of brand-name drugs and are the same as those brand name drugs in dosage form, safety, strength, route of administration, quality, performance characteristics and intended use.” Generic drugs cost about 50 to 80 percent less than their brand name equivalents, so it makes all the sense in the world to speak with your doctor about making the switch. These programs are often offered through the government, or volunteer organizations. Either way, as a caregiver, you can be provided with respite care by volunteers, as well as counseling and Support Groups to ensure your physical and emotional wellbeing. These services are designed to supplement, not replace, the efforts of the family in caring for a loved one. LifeLine is a federal government program for qualifying low-income consumers designed “to ensure that all Americans have the opportunities and security that phone service brings, including being able to connect to jobs, family and emergency services.”LifeLine assistance provides one free or discounted phone (either landline or wireless cell phone) per household. To qualify, seniors will likely have to be on some form of government assistance, such as Medicaid, food stamps, Supplemental Social Security, Temporary Assistance for Needy Families, or the Low Income Home Energy Assistance Program. Visit LifelineSupport.org to see if you qualify and to find participating companies in your state.I was able to get my mother a free cell phone within five days of her being approved for Medicaid, after providing a picture of my mother’s Medicaid award letter (yes, I know it is shocking for the government to move that quickly). The only drawback to the program is the type of phone that you are sent. My mother can use it but it has smaller buttons that can make it confusing. I would prefer for her to have a larger handset with larger buttons, but this is working for the moment. A new service that is (at least temporarily) being funded by the FCC, called CaptionCall, provides free phones to those with medically recognized hearing loss.The way that this phone works is simple. A screen on the phone instantly takes the words being spoken and puts them onto a screen on the phone so that hearing impaired individuals can read what is being said. You can learn more at CaptionCall.com/Caregiver (and click on Promotions) for more information. This used to be called Food Stamps, but is now known as the Supplemental Nutritional Assistance Program (SNAP). You can apply through your state Office for the Aging, or Elder Affairs Department.Each state has slightly different requirements based upon income, but what I have found is that most states have a website (www.mybenefits.ny.gov in my home state of New York) where you can set up an online account and, based upon your age, zip code, income and residence status, you are then directed to all of the benefits that you are eligible for.Once you are approved, the maximum monthly benefit depends upon the size of your family, from $200 all the way up to $1,500. In addition to programs such as SNAP, there are many nutrition programs, offered either by local charities or local governments that can provide seniors with a nutritious meal (typically lunch) and the opportunity to socialize.Check with your local Office for the Aging to see what programs are available in your area. In my county, there are 33 such nutrition sites that seniors can attend and, in some cases, transportation is provided.There are also websites that have listings of local food banks where qualifying individuals can receive free food. The best food bank search engine is at Feedingamerica.org. Simply plug in your state and a listing of locations and the types of services offered at each food bank will pop up. When my mother had her heart attack and I started the Medicaid application process, I quickly realized that there would not be any money to pay our mounting bills. So I called my local Office for the Aging and they put me in touch with a local law school that operated a Senior Law Center for low income seniors like Mom.They wrote a letter to the creditors on my behalf asking for the debts to be forgiven. With this letter I attached a letter from the nursing home detailing Mom’s prognosis. That was 14 months ago, and I haven’t heard from the creditors since, so I guess that ‘no news is good news.’ I did receive one confirmation letter, from Wal-Mart, that the debts were forgiven. The others have not contacted me yet, so I am hopeful that they’ve written the debts off as bad debt.These types of law centers won’t represent you in a large scale, but they can be invaluable in drafting a simple will, certifying a POA or health care proxy, or drafting a letter to creditors.If your Office for the Aging is unaware of a local resource for such help, another place to look would be the Lion’s Club. Many of the members of the Lion’s are attorneys and local business leaders who may be able to help you find a pro bono attorney to handle something like this. A walker will run you around $40 (rollators are a little more expensive). That can be a lot of money for a cash-strapped senior. If you are looking for a discounted or free walker, try thrift stores such as Goodwill, which operates stores throughout the country and has very reasonable prices. Hospitals and nursing homes may periodically dispose of reliable, used equipment that may be ideal for you. Through your local or state Office for the Aging, you can apply for assistance either in the form of weather upgrades to your residence – such as added insulation in the attic to improve the energy efficiency of your home (this is known as the Weatherization Assistance Program) – as well as direct cash assistance based upon your income level.One not widely known fact about HEAP is that it is available to both homeowners and renters, making it more widely accessible for low-income seniors. For caregivers of nursing home patients, the state ombudsman’s office is there to address issues with the care of their loved ones. You can think of the ombudsman as similar to a union rep. They will investigate complaints on your behalf to insure that nursing home residents are being treated fairly.I previously wrote about my own experience with nursing home neglect against my mother and how I brought in the state ombudsman to investigate the issue.If you feel there is an issue of neglect or abuse of a nursing home resident, getting the contact information is easy. This information must be prominently displayed in the lobby of all nursing homes, along with the website and phone number to call for help. Need some minor work done around the house, but can’t afford the labor? Many Offices of the Aging run a residential repair service where seniors can have minor work done to their home or rental at no labor cost.NOTE: You will have to pay for supplies, but the labor is free from the volunteers. Caregivers of seniors with dementia are often concerned about a loved one wandering or getting lost, especially if they are driving with dementia. There are many ways to combat this. One way is through a Silver Alert program, which is a public notification system in the United States to broadcast information about missing persons – especially seniors with Alzheimer’s Disease, dementia, or other mental disabilities – in order to aid in their return.Silver Alert and similar programs vary greatly by state. The way the Silver Alert program works in my local area is as follows:The caregiver will preemptively enroll their loved one by contacting the local police department and filling out a form identifying the senior and giving a physical description, as well as any medical information you wish to disclose.Your parent will then be issued a Silver Alert bracelet that will have a unique ID number and instructions for anyone who locates them to call a non-emergency police number. This way they can be safely returned home without compromising any personal information on the part of the senior or caregiver.Check with your local Police Department for more information. 5 Benefits of Technology to Share with Seniors and Their Caregivers. Technology has come a long way over the course of older adults’ lifetime. They have witnessed everything from men landing on the moon to dramatic medical advances and the rise of an Internet-dependent society. At the age of 60 and above, how tech savvy and social media active do you think you will still be? From their genuine innocence and enthusiasm, we’ve all come across clips and photos of seniors trending all over the internet. But what we see online are snippets OF them, not FROM them. Do you think they’re they even aware of their fifteen seconds of fame? If used improperly, social media and technology usually get a bad rap for having negative effects on our wellbeing, but what about the group who barely uses it? Their exemption from both the wonders and evils of the internet is actually optional. Advancements that may threaten our life’s longevity can do the opposite, especially for the older adults. Three out of five older adults are already cell phone owners, but aren’t smart phones and serve just the basic purpose of being able to make and receive calls. On the other hand, 28% of them are already familiar with and use tablets Kindles, eBooks or Nooks for reading or accessing sites that cater to seniors. According to Pew Research statistics, 6 out of 10 seniors actually go online on a regular basis with 77% still needing help with walking through the vast online world. Older adults may be slower to adopt to new technology, but they’re definitely proving that if the young ones can do it, so can they. This is proof of seniors breaking the stereotype that they’re too afraid or stubborn to give new technology a try. Research reveals that seniors who get online have better mental capabilities than those who refuse to connect digitally. For people their age, internet use reduces their risks of developing depression and dementia. Also try to introduce them to applications that promote physical wellness. Teach them how to use a digital pedometer so they’re more motivated to squeeze more steps in their daily routines. There are even games that make it easy for grandma and grandpa to join in on the fun. Keep an eye on them though, and make sure they don’t exhaust themselves while trying to beat each others’ high scores. No one’s forcing grandma to setup accounts on platforms like Twitter, Instagram, or Snapchat, but if she wants to, let her connect. This may be just what she needs to overcome loneliness that most, if not all, seniors experience. Those who live in retirement or nursing homes will have the freedom of contacting loved ones on their own. Phone calls turn to video calls and Facetime sessions, while letters convert to emails and instant messaging. This also makes it easier for them to reach their healthcare providers. Around this age, seniors may suffer from at least one chronic pain or illness. These may range from diabetes, arthritis and hypertension. It’s nothing to be ashamed of since these pains are merely a part of growing old. Those with a hint of Alzheimer’s can use technology to their advantage by setting up apps with built-in trackers, reminders and notifications. Digitally hook them up to apps that track health statistics, medical aids and monitoring systems. Technology has made it so much easier for them to get help at the push of a button. Even if their phones are locked, there are features that will allow rescuers to access critical information. Online shopping may not be their biggest priority once they have internet access, but there are definitely products they can significantly benefit from. Grandma and grandpa can have some fun too. Receiving care and support in the comfort of their own homes has never been easier. Can you imagine how much more difficult it is for our parents and grandparents to adjust? As a millennial, I admit to still having times where technology greatly frustrates me. Despite the fact that my generation (Y) is considered one of the most tech-savvy, there are gadgets and gizmos that continue to confuse us. Even with easy accessibility features, there will still be seniors who find technology physically challenging no matter what. iPad training centers and training courses are even available for people in the 60 and up demographic. Some seniors just refuse to plug in to the present despite the resources available to them, claiming that they don’t need to do what the younger generations are doing. Are you ready to teach grandma and grandpa how to use Skype yet? But first, teach them the art of the selfie. Ayah is a content writer and editor for Scoopfed.com. Formerly a student journalist. Full time writer, part time bibliophile and a TV series hoarder-slash-enthusiast. You can also find her on Twitter @ayahgranada.